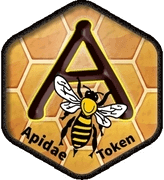 Custom Description: The Apida&amp amp amp eacute token (AAT): An electronic money system to help save bees. https://www.rucher-apidae.com https://client.wavesplatform.com/dex?assetId1=WAVES&amp amp amp amp assetId2=5akGU6TuhfinM3E27vD9ncEBpDfp1fRpdMDAEQSvTe6j 1. Introduction: The purpose of Apida&amp amp amp eacute token is to set up a project and decentralized alternative applications. This set brings together security, speed, sharing of information and different compromises that we think are very useful in beekeeping and maintaining colonies that are so threatened. the apida&amp amp amp eacute token uses a decentralized WAVES blockchain. 2. Incitement We created the Apida&amp amp amp eacute token to help us maintain the bee population! Who does not know the problems that our dear bees are going through? Just buy the Apida&amp amp amp eacute token to buy on our website product hive, equipment or sponsor a hive. With the funds raised with the Apida&amp amp amp eacute token will allow the breeding and the maintenance of the next colonies which will serve for the maintenance of the livestock, the production of honey or which will be or resold to other beekeeper to fill the annual losses. To allow this you go on the platform WAVES, you buy WAVES that you turn into Apida&amp amp amp eacute token, do not panic if you can not do this, our team can guide you by phone. The difference between a classic site and the concept of the Apida&amp amp amp eacute token, any pennies can take value thanks to the exchange platform WAVES which works on the principle of the stock market but unlike the stock market classic Apida&amp amp amp eacute token will have always a value on our site and helps bees. 3. Conclusion: The apida&amp amp amp eacute token was created primarily for an easy payments on our site thanks to a cryptocurrency system. The Apida&amp amp amp eacute token project is the first cryptocurrency intended for the protection and welfare of bees.